Are compatible cartridges available for the MP270 printer? At the moment my cartridges numbers are black 510 and colour 511 but you're showing different numbers, namely 512 black and 513 colour. Have I been using the wrong cartridges? That may explain why they're blocking up! If you can confirm that PG510 and CL513 are the correct numbers then I will order them? Many thanks, Ian Gregory. Any of the ink cartridges listed on this page (PG-510, PG-512, CL-511 and CL-513) will work in the Canon Pixma MP270 printer. It appears that you've been using the standard capacity ink cartridges which are the PG-510 black ink cartridge and the CL-511 tri-colour ink cartridge. You can also use high capacity cartridges instead of the standard cartridges you're currently using so instead of buying the PG-510 black cartridge you could buy the PG-512 high capacity black cartridge. The CL-513 high capacity tri-colour cartridge can also be used instead of the CL-511 standard capacity tri- colour cartridge in this printer. It will depend on how much ink you use and how much you'd like to spend on your replacement cartridges as to whether or not you opt for the high capacity Canon Pixma MP270 ink cartridges. We also sell cheaper compatible PG-512 and CL-513 high capacity ink carridges which are even more economical and offer you the lowest cost-per-print. Because the cartridges you've been using have the correct numbers we wouldn't advise you that any problems with them are compatibility related. It's more likely that you'll need to run a cleaning cycle to prevent any dried ink that may have accumulated on the printheads from causing blockages. In the booklet with my Canon Pixma MP270 printer it lists a Canon FINE cartridge in black with 320 nozzles and a colour cartridge with 384 x 3 nozzles. What's the difference between these cartridges and the ones listed as Canon FINE cartridges PG-510 or PG-512 black and CL-513 or CL-511 colour. Does it matter which one I buy or is one better than the other? I look forward to your reply. Canon's FINE cartridge system combines the ink tank and printhead in one single unit so by replacing the Canon PG-510, PG-512, CL-511 or CL-513 FINE ink cartridges in your PIxma MP270 you'll be replacing the ink and the printhead at the same time. The Canon PG-512 and CL-513 are high capacity ink cartridges that contain more ink than the standard capacity Canon PG-510 and CL-511 ink cartridges. The only difference between these cartridges is the volume of ink, there's no difference in the quality of output as they use the same type of ink and printhead in a larger capacity cartridge. What are the different capacities of the Canon PG-510 and PG-513 black ink cartridges please? Black Canon PG-510 ink cartridge (2970B001AA): 9ml / 220 pages @ 5% coverage. High capacity black Canon PG-512 ink cartridge (2969B001AA): 15ml / 401 pages @ 5% coverage. Are the Canon MP270 ink cartridge numbers 512 or 510 for the black and numbers 513 or 511 for colour? The Canon PG-512 and CL-510 cartridges contain black ink. The Canon CL-513 and CL-511 contain tri-colour ink. Dear Sir / Madam, can you supply me with a handbook or information guide for my Canon Pixma MP270 inkjet printer? Yours, Alex. I've been using Canon PG-510 and CL-511 ink cartridges. You're saying to use PG- 511 and CL-513. Which is the correct pair? The Canon Pixma MP270 takes all of the above cartridges. The Canon PG-510 and CL-511 are standard capacity cartridges whereas the PG-512 and CL-513 are the higher capacity cartridges. Shopping for MP-270 inkjet cartridges will only take a couple of minutes, and that's really fast in comparison to the incredibly dull job of phoning each individual shop there is in your community for your replacement supplies. You don't need to go to the bother! We've done all of the groundwork so that you can order all of the replacement ink cartridges known to be compatible to use in the MP 270 printer - all that's necessary will be to pick the cartridge. Save your time and money if you order your printer supplies at Cartridge Save! Place an order for genuine or compatible Canon ink over the internet at our shop and you'll also get the availability of free next day delivery for all. Our whole business is totally committed to supplying brilliant value for money, plus we're just as enthusiastic about making certain that every MP270 ink cartridge does what you'd expect each time you use your printer. 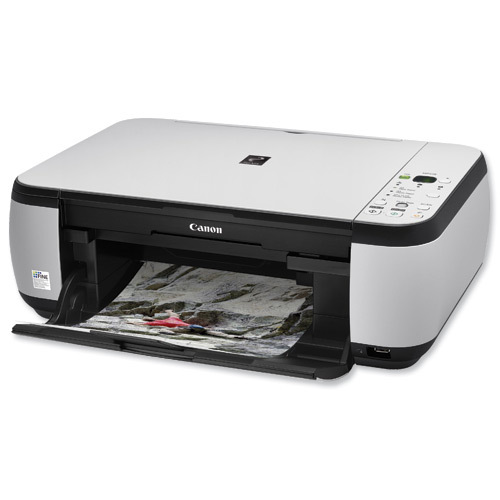 The award winning Canon MP270 inkjet printer is an affordable, compact, multifunction printer. Canon has positioned the MP270 as a budget home printing device that's also capable of scanning and photocopying. Don't expect laser speeds or lab-quality prints; the MP270 is reliable, however, and as a home printer offers a level of performance that's more than adequate. The stylish and compact design is similar to Canon's other PIXMA printers and is suitable for the smallest of bedrooms or studies. The control panel on the top of the printer has buttons for scanning and copying and the paper feed at the rear can hold an impressive 100 sheets. The inkjet also comes with a PictBridge socket to allow you to print directly from a camera. Access to the Canon MP270's ink cartridges is under the scanner section, which is easy to get to. Print speeds are fairly good with plain text documents taking around 8.4ppm and colour graphics a spritely 4.8ppm. Normal print quality is good for day-to-day documents; although not as impressive as Canon's four and six-colour printers, the MP270 is more than adequate for home applications. Plain text prints were equally as good, lettering appeared clear and dark with no signs of fading. Canon have overlooked the importance of connectivity. Unfortunately the MP270 lacks support for any of the major memory cards or USB sticks. Canon also opted for a single USB port as opposed to Ethernet or wireless – this may pose a problem for anyone in a household with more than one computer.